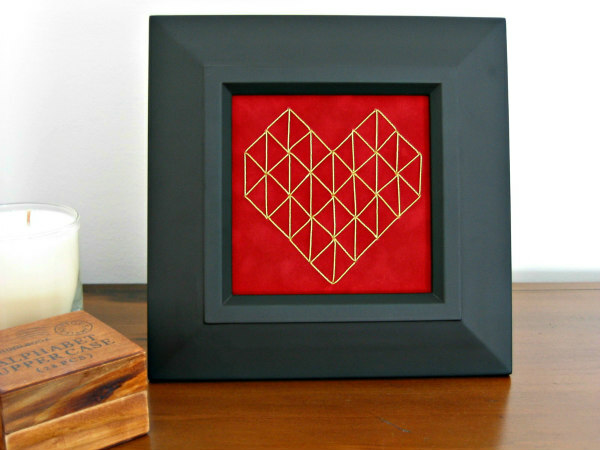 I'm loving the geometric and metallic gold design trends, so had the idea to use ornament cord to stitch a golden geometric heart on paper. Okay, you caught me - I hadn't put away the Christmas craft supplies quite yet... turns out they're handy for Valentine's Day too. 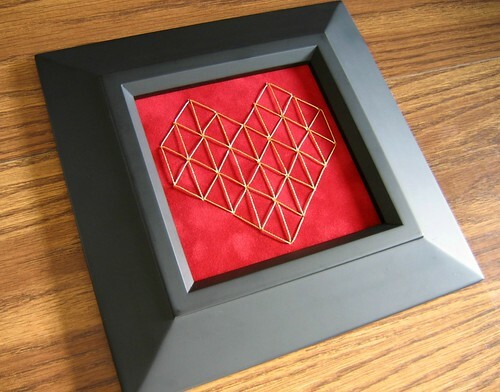 After googling geometric heart images and finding one I liked, I printed it out and cut around the perimeter. Next, I trimmed down a piece of deep red suede paper to fit my frame. Suede paper, if you haven't run across it before (also called velvet, but it looks more like suede to me) is very nice stuff and comes in rich colors. 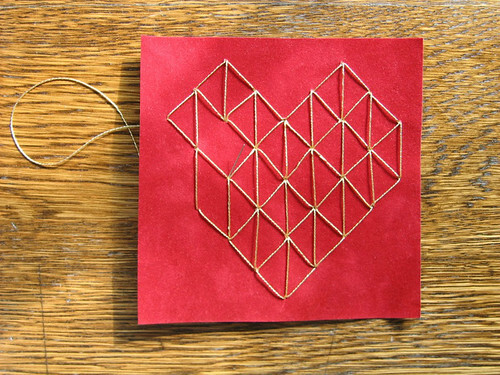 I taped the heart to the center of the paper and used a straight pin to pierce a hole at each angle. The holes barely showed on the suede surface, but were clearly visible on the paper backing. After discarding the heart pattern, it was time for the fun part - seeing the design take shape while stitching from hole to hole. I used a counted cross stitch needle because the eye was large enough to accommodate the cord, but the barrel was not so thick that it would enlarge the holes too much. I used small pieces of tape to adhere ends on the back - there's no need to tie knots. My 3-ply cord tangled a bit, but the glittery shine made the struggle worthwhile. DMC Perle Cotton embroidery thread would be a good alternative. 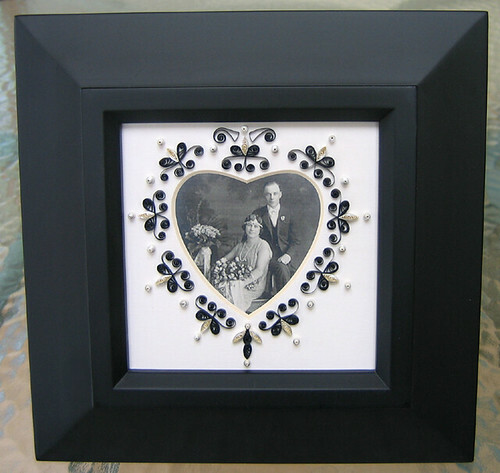 I had purchased the frame several years ago when I was into doing quilled borders. The look was romantic in an old-fashioned way, but it was time for a makeover. Who are the couple in the picture, you ask? No idea - ha! Just the result of another Google image search. I hope their family doesn't mind that they've been living on my mantel. Guess what? I finally posted answers to your Quilling FAQ. If you're interested in learning to quill but don't know where to start, I hope you'll find them helpful. 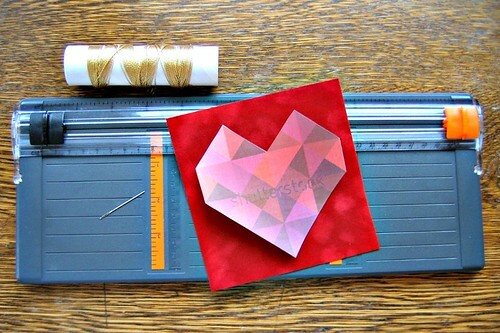 You'll also find paper craft supplies I recommend in my Amazon shop. ann....what a creative idea. the black gold and red are so classic together. happy valentines! So neat . Your quilled border looks so elegant!!!!! Aw thanks everyone, and Happy Valentine's Day to you! Thank you for this fabulous design. 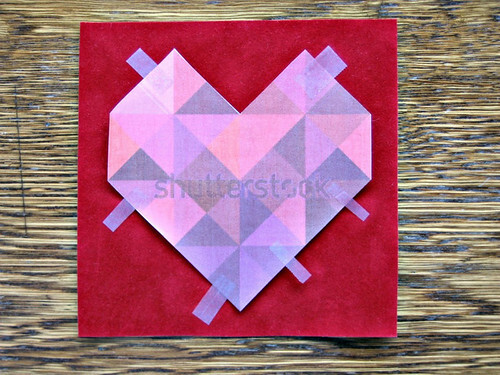 I made some geometric heart cards for my friends! How nice to hear that!